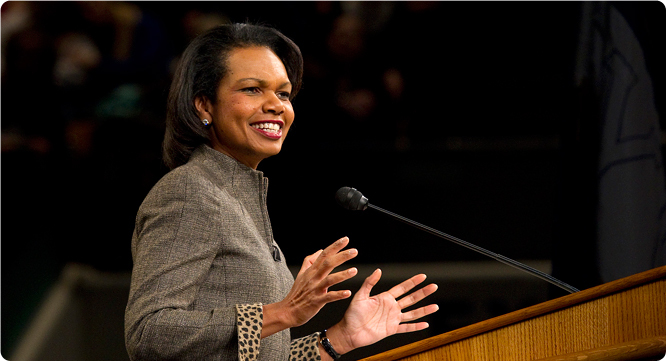 Nearly 18,000 filled BYU's Marriott Center for former secretary of state Condoleezza Rice's forum address on topics ranging from democracy to the state of education. Read remarks from her address. U.S. News & World Report has once again named BYU the nation's most popular university. See what draws students to BYU in this video, Spirit of the Y.
Relive the game that made Marriott Center history, from students camping out for tickets to fans rushing the floor after BYU's win, with this photo slide show. At 326 pounds, Dian Thomas needed a change. She learned tools for healthy living, lost 125 pounds, and wrote a book about it. Watch her story. At only 14, Robert Nay topped iTunes' most popular free apps chart with his game, Bubble Ball. Nay says he wants to attend BYU, where his parents attended. On Feb. 2, alumna Yolande Bouka will share research on the prisoners of the Rwandan genocide. See the calendar. On Feb. 23, journalist Elisabeth Bumiller opines on what China's rise means for the United States. See the calendar. Held April 4, the annual conference of the LDS International Society will discuss the erosion of religious liberties. Participate in cross-cultural research, engaging discussion, and reflective analysis at this free conference in March. Learn about You Can Do This, a tool from the McKay School that shows how good parenting helps kids excel in school. Faculty member Steven Hite is working with UNESCO to improve education conditions in the wake of crises. Check out two BYU grads' award-winning website, Learning.com, a site meant to enhance classroom instruction. Despite the increasingly positive portrayal of characters with disabilities in award-winning books, there are still inaccuracies. BYU research shows that a short series of classes for troubled teens keeps them from running afoul of the law again. Ross Thompson, the Marjorie Pay Hinckley Endowed Chair lecturer, will address kids' emotional health on Feb. 10. BYU's public relations program was once again named one of the top five in the country by PRWeek. After serving 25 years on BYU's dance faculty, Marilyn Berrett has been appointed chair of the Department of Dance. Theatre Ballet celebrates its 40th year with Cinderella, with live accompaniment from the BYU Philharmonic Orchestra. See BYU's production of Babe, the Sheep Pig, adapted from the book that inspired an award-winning motion picture. Former mechanical engineering professor Brent Webb is now BYU's academic vice president. Collaborating with universities around the world, BYU engineering students improved high-end remote-control cars. Celebrate Engineering and Technology Week at the Fulton College with tours, competitions, and displays. Linguistics professor David Eddington has profiled those who make certain glottal stops: see the demographics. Most Christian scholars focus on Europe, but Asian languages professor Van Gessel shares a look at Christianity in Japan. Professor David Moore's article "Do U.S. Courts Discriminate Against Treaties?" was published in the Columbia Law Review. BYU law alumni teach about 400 students each year in 10 law schools throughout Ukraine. Should governments reduce legal protection for religious speech to prevent terrorism? See what BYU and Utah law professors had to say. See what Law School alum Charlie Freedman, vice president of DownEast Outfitters, told students about entrepreneurship and following their classmates. The Monte L. Bean Life Science Museum achieved the highest national accreditation for a museum. Microbiology and Molecular Biology Department chair Brent Nielsen's research was featured in the Mormon Times. Jamie Jensen, the newest faculty member in the Biology Department, was profiled in the Daily Universe for passing on her love of biology. Students are usually the ones pitching themselves to companies, but the tables turned in a recent trip to New York City. BYU is gaining recognition as a business startup factory, churning out hundreds of student-run ventures each year. BYU's first Ballard Fellow, Lewis Hower, and his University Impact Fund are generating opportunities for the poor. BYU's chapter of the Association for Systems Management was named one of the best in the world. Peruse the 2011 issue of the College of Nursing's magazine, Learning the Healer's Art, and access past issues. Things are heating up--and blowing up--in the newest Hands On video, which goes behind the scenes in the chem lab. See how math professor Lennard Bakker is applying mathematics know-how to the solar system's mysteries. This BYUTV program features Carl Bloch's art, on display now at BYU's Museum of Art. See BYU Magazine's feature on Bloch. BYU groups are touring more than 112 cities worldwide. Check for tour dates near you. BYU will host a symposium to commemorate the King James Version of the Bible. BYU Telefund students invited 85,000 alumni to donate in 2010, and they love their jobs.